I have so much to update you on. I’ll start here. There is no easy answer to the question “So, what will Ethan be doing when he graduates in June?” No easy answer at all. So, mostly, I stare at people, dumbfounded. 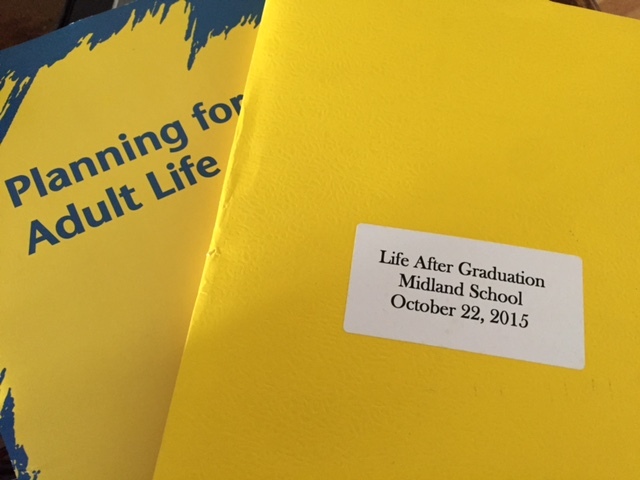 I attended at meeting at The Midland School entitled ‘Life After Graduation’ and was provided with other resources entitled ‘Planning for Adult Life’. Both of those titles promptly made me queasy. It was the first meeting in a very long time that induced blurry, slightly tearful vision that I blinked back. Of course, it makes perfect sense that we are dealing with these issues ~ and we have had twenty years to prepare for this time. But for all those years we’ve been doing what is right in front of us, the next thing, putting out fires, sometimes surviving and occasionally thriving. I put my head down and forged forward so many times ~ when I picked my chin up ~ I am staring this straight in the face. Here are the major players. DDD used to provide people with ‘programs’ – vocational, day services, medical daycare, recreation, etc. Now they issue a ‘budget’. This plan is theoretically supposed to allow for more individualized programing of an individual’s lifestyle choices and needs. The budget is based on an assessment tool called the NJCAT. It is a survey of nearly every facet of an persons life and will require it’s very own blog post. Suffice to say, DDD is a major component of people with DD’s lives and requires careful navigation. The more I learn, the more I will post. SCAs are state-approved agencies that guardians need to select to administer the ‘budgets’. You cannot access this funding on your own. Everything and everyone needs to be properly licensed and approved before they can provide anyone is the system with anything – day programming, vocational training, transportation, recreation, assistance with ADLs (activities of daily living), etc. I am in the process of selecting an SCA as we speak and it is a process that also needs it’s own post. Ethan and I recently met with DVRS. I will post about that under a separate post, as well. Are you catching on? Information overload. DVRS provides people who have any impediment, including developmental disabilities, to competitive employment supports and assistance to achieve employment. It is my understanding, after our first meeting, that this services is not funded through the budget from DDD. I have not received any notification yet that Ethan is eligible for their services and will have to wait and see if this agency will be helpful to Ethan in any way. I have been told by other people with adult children with similar skill sets to Ethan that they have not been of much assistance. I hope to report differently. There are other agencies and organizations involved, as well. There are ‘day programs’ that provide a range of vocational, recreational and daily living activities. There are places like Midland Adult Services which I expect to become part of Ethan’s week and life. I found this and it needs exploring. I have a tour scheduled. Hopefully there are more organizations offering these types of services. I have ideas and he does too of what types of things should fill his week. I feel like I am navigating a winding staircase in the dark. I still don’t know the destination. I definitely have the feeling this is more about the journey than any particular location. So, when you ask where we are headed, don’t be surprised if I look a little like a deer in headlights…without a flashlight…going uphill. Don’t worry about me, though. I’ve been here before.